It’s our son Alex’s 19th birthday today, and my husband and I have lots of things planned to help celebrate the occasion. We are heading up to London later to see a matinee performance in the West End, and then we will be having a celebration dinner at one of Alex’s favourite restaurants, The Criterion in Piccadilly Circus. I think every moment of a birthday is important, and any birthday celebration in our house always starts with the birthday person’s breakfast of choice. Alex always chooses pancakes for his. What do you have for birthday breakfasts at your house? One of the reasons I enjoy co-hosting Let’s Do Brunch is that I think breakfast, lunch and brunch can be every bit as much a main event as dinner or supper. Let’s Do Brunch is a great way to share our favourite breakfast, lunch and brunch recipes and it’s a wonderful resource when I am looking for inspiration. Thank you to everyone who contributed last week. My co-host, Chaya of My Sweet and Savory and I always look forward to visiting your posts and trying out the wonderful new ideas you share. Chaya has chosen some of her highlights from last week’s hop (I’m very flattered that she has chosen one of my recipes! ), and here are two of mine. 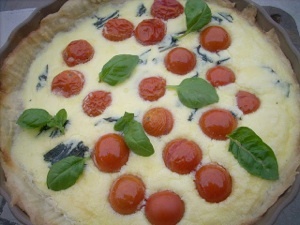 Gloria of Canela Kitchen has shared a beautiful taste of spring that is perfect for lifting my mood on a cold and damp winter’s day – her Roasted Cherry Tomato, Basil and Parmesan Quiche. Doesn’t Gloria’s quiche look beautiful? I can just imagine how delicious it tastes! 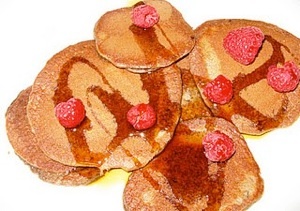 Laura from Gluten Free Pantry shared some wonderful pancakes with us last week. Her Raspberry Pancakes are gluten and dairy free, but they look so delicious I am sure even those who don’t suffer from gluten or dairy allergies will want to give them a try! What have you been cooking for breakfast, lunch or brunch this week? Share it with us! Any dish that would work for any of these three meals or as part of a brunch buffet is welcome. Include a link to your recipe post, rather than to your blog. 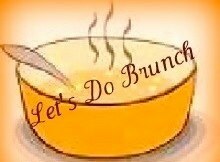 Include a link to one of the hosts in your post, so that others can find us and join in Let’s Do Brunch too.